Home Costs > How Much Do Sandbags Cost? A sandbag is a container made of a polypropylene material, filled with either soil or sand. It’s used for different purposes such as flood control, and the amount of soil or sand inside the sack varies depending on the need. Sandbags have been used to protect soldiers as they use it as a temporary fortification since it can absorb some pressure from the incoming hostile fire. They are also compact enough to be used to control a flood, preventing the area from overflowing. Sandbags can also be attached to weights as a means of weight training. 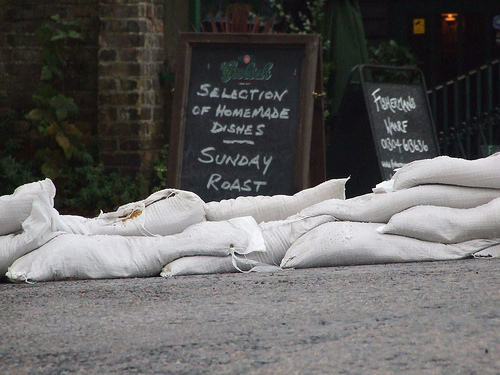 The price for sandbags depends on the type, capacity and where you purchase them from. On average, empty polypropylene sandbags cost anywhere from $20 to $60 per 50 pack. For example, a 50 pack of Hercules sand bags at Home Depot retail for about $20. Lowe’s sells for the same price. These are considered to be the economy type of all sandbags available. A cost of a filled sandbag, delivered locally, will cost about $3 to $4 per bag, minus the delivery fee if you don’t pick it up. Sandbags, designed for withstanding gunfire, commonly used at a shooting range, can cost $65 to $85 per 10 pack. For example, the Sand Bag Store sells a 10 pack for about $70. Smaller sandbags, commonly used for weight training, can cost about $4 to $6 each or about $40 per 10 pack. Bulk sandbags, which can hold more than 3,000 pounds, can cost about $30 to $40 each unfilled. A sandless sandbag, which will expand as water is added to it, can cost about $40 per six-pack. These bags work just like a normal sandbag, but as the name states, it will activate with water and will not require any sand or soil. These bags work the same way and can last for months once inflated. For example, the Quick Dam sandbags retail for about $25 per 10 feet. TrueValue $30 for one sandless 6"x10"
Sandbags are generally made of a durable polypropylene material that will not leak, but some bags will be made of burlap, a natural fiber derived from sisal. Regardless of the type you purchase, each bag will be woven tight enough to be able to contain the sand inside. The sand can be placed inside the bag and once inside a drawstring can contain the sand or soil. Sandbags can be bought filled with soil or sand, preventing you from buying soil or sand separately; however, this isn’t the case most of the time, especially if purchased online. Most sandbags can be filled with soil or sand up to 45 to 65 pounds. Bulk bags can hold up to 3,000 pounds. Most retailers will sell in packages of 10, 25, 50 or 100 and can be found at just about any home improvement stores or online via Amazon. If you buy empty sandbags, it will include just the bag itself and you will need to buy your own soil or sand to fill it. The price of the soil depends on the amount that you will need. On average, a 50-pound bag of sand usually retails for $20 to $50. Bulk purchases can cost less if you purchase more than 500 pounds. Due to the weight, shipping and/or transportation fees may apply, depending on the amount purchased. Some local retailers may waive this fee if a minimum amount is purchased. If you’re going to use the sandbags for more than a few months, then it’s advisable to choose a synthetic or sandless bag since the material won’t biodegrade. Sandbags made from this material can be reusable, but as with anything, it can still wear down over time, becoming less effective. Aside from controlling floods, sandbags can often be found used for target shooting, camping, yoga and even horseback riding. It’s highly advisable you don’t substitute other bags to be used as sandbags. Some people often think feed bags could be a substitution, however, even though it’s made from a similar material, the bags won’t be large enough for handling and stacking. With sandbags, the more you purchase at once, the more you’re going to be able to save. If flooding is a concern in your area, the local police or fire department may have bags available for its residents. Call or visit your official local public safety website to see what kind of options are available. Come on… an average 50-lb sand bag (filled) costs $3-$5. Where do you get off telling people it’s $50?!? That’s just insane.